HEREFORDSHIRE NEW LEAF work with people around the county to develop ways of saving energy and living more sustainably. They are involved in projects including H.Energy Savers and the Local Nature Partnership. The HEREFORDSHIRE IN TRANSITION (HiT) ALLIANCE is a coalition of the county’s local Transition Town and environment groups, individuals and other organisations. The purpose is to foster partnerships and joint efforts which strengthen the sustainability of our communities. The BULMER FOUNDATION aim to to promote sustainable development and sustainable practices in Herefordshire and beyond, and amongst many other things, offer a Masters Degree in Sustainable Development Advocacy. KLEEN is a community organisation for Kington, North Herefordshire, focusing on Sustainability. It organises litter picking, supports allotments and Green councillors, and was one of the groups represented at the first Spring Greens Fair. 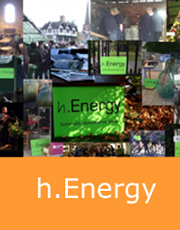 H.Energy is a key part of the growing movement to save energy and live more sustainably in Herefordshire. h.Energy week involves everyone around the county including schools, farms, community groups, businesses, householders, charities, shops, restaurants, councils and public organisations. METNET is a network that promotes collaborative working among businesses that provide products or services within the environmental technologies sector in Herefordshire, Worcestershire, Telford & Wrekin and Shropshire. They provide opportunities for training, collaboration, and access to grant funding. A number of exhibitors at Spring Greens are members of metnet, and they welcome new members. SEND A COW work hand in hand with families in Africa, providing livestock and training in natural organic farming practices alongside courses in gender equality, conflict resolution and more.